It measures the resistance of the PT100 RTD and then calculates the corresponding temperature. It then outputs the measurement as a low speed serial pulse train to a standard PLC digital input. The PLC receives 16 bits of data in a format ready to load into a 16 bit data register. The PLC register ends up containing the value of the measured temperature in degrees C x 10. For example if the measured temperature is -5°C the transmitted data will be -50, and if the measured temperature is +10°C the transmitted data will be 100. 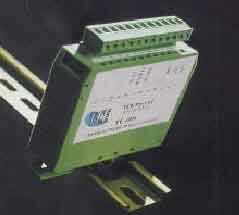 Transducer is a unique sensor designed to monitor temperature and transmit the value to a PLC digital input. Although it requires only one normal digital 24VDC input on the PLC, it provides an accurate temperature measurement (inbuilt PT-100 RTD) for use in the PLC program. 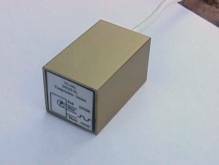 It is packaged in a robust 25mm square Stainless Steel housing, 40mm long, with a 3metre long wiring. The TC-004 Analog – Din Rail mount Version. Digital Converter is a unique device designed measure an analog input and to transmit to a PLC digital input. Although it requires only one normal digital 24VDC input on the PLC, it provides an accurate analog measurement for use in the PLC program. It is packaged in a standard Phoenix DIN Rail mounting enclosure, with a removable 12-way screw terminal strip. It measures the analog input, 0 – 20mA or 0 – 10V. It then outputs the measurement as a low speed serial pulse train to a standard PLC digital input. The PLC receives 16 bits of data in a format ready to load into a 16 bit data register. The PLC register ends up containing the value of the measured analog value as 0 – 32767.